Silloth Green, incorporating Harbour Green, a large area known simply as ‘the Green,’ and Skinburness Green is one of the largest and longest village Greens in England. The Green forms a grassy link between the Silloth townscape and the sea front promenade, complementing the grand regency style buildings on Criffel Street, which runs along the opposite side of the broad cobbled road. Enriched by the green space and close proximity to the sea, this former Victorian spa town has a unique air, making it an interesting place to visit. The Green lies within the Silloth conservation area and the buffer zone of the World Heritage Site of Hadrian’s Wall. Close by lies the visitor centre for the Solway Coast ‘Area of Natural Beauty.’ (AONB) and two ‘Sites of Special Scientific Interest’ (SSSI) stretch North and South of the town. Successful funding bids to Heritage Lottery Fund (HLF) under the ‘Parks for People Programme,’ resulted in a two year refurbishment project to restore the Green and its heritage buildings. Restoration work was completed in 2012 and was celebrated with a grand opening on 20th May 2012. 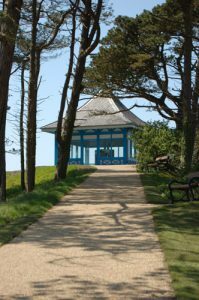 For more information about Silloth Green, its history, forthcoming events etc take a look at the dedicated website at www.sillothgreen.co.uk and also the Facebook and Twitter pages. Silloth Green is one of the very best in the UK – and that’s official. Among a record-breaking 1,447 parks and green spaces, Silloth Green has received a prestigious Green Flag Award for the last four years in succession. The Green Flag Award Scheme is managed in the UK by a consortium, comprising Keep Britain Tidy, The Conservation Volunteers and GreenSpace. Known collectively as the Green Flag Plus Partnership, the consortium manages the scheme in England on behalf of the Department for Communities and Local Government and in Wales for the Welsh Steering Group. Green Flag Award recognises well-managed, high-quality green spaces. Any green space in the UK is eligible to win this award providing it is freely accessible to the public. Previous winners include parks managed by local authorities as well as those run by community groups and trusts. The scheme was set up in 1996. The Town Council are committed to supporting festivals and events in the town, for the benefit of residents and visitors alike. If you would like to apply to hold an event on the Green, it will be necessary to fill in an application form. The application form and other relevant documentation needs to be returned to the Town Clerk at least 28 days prior to the event but it is advisable to get in touch long before the proposed event to get the Council’s initial approval and to make sure the date is available. For more information about organising an event check out the following page. Please contact the Town Council Tel: 016973 31128 or email: townclerk@silloth-on-solway.co.uk to report any damage or graffiti. Alternatively, complete our Contact Form.